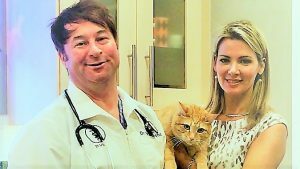 Founder and Director of The Cat Behavior Clinic, learn more about her past and current study of Animal Behavior and Animal Welfare through Oxford University, The Royal School for Veterinary Studies – The University of Edinburgh, and you can read about her experience at Harvard University here. The Cat Behavior Clinic is the first cat-only behavior consultancy in Seattle serving cat owners since 1999. Please read our clinic testimonials – over 200 case study reviews. Visit our Clinic Home Page to Schedule. Cat Behaviorists Few and Far Between: Mieshelle, one of three notable cat behaviorists, is world-renowned for her global leadership in cat behavior education and crossing the conventional boundaries of the cat behavior profession. She is a cat expert for National Geographic cat documentaries and published works specifically on the 37 species of tigers and wildcats including domestic cats and an expert on wildcat hybrid behavior. You can view her work on: Howie Mandel’s Animals Doing Things for National Geographic, The Wild Side of Cats on Nat Geo Wild, The Today Show, Hallmark Channel, Animal Planet, the New York Times, MTV, NBC Dateline, New York Post (just to name a few). Mieshelle provides cat owners and veterinarians behavior plans based on a cat’s feline evolutionary biology. She goes beyond the obvious facts about cat behavior and offers proven solutions to change your cat’s behavior long term. Her cat behavior science book, published in 4 languages (Random House Publishing) is the first scholarly-cited cat behavior book for cat owners. Mieshelle Nagelschneider can perform in-person, video, or phone consultations in the Seattle area or State of Washington. All in-person consultation are scheduled in advance for the Seattle and surrounding area locations. Mieshelle will travel to the cat’s location to assess the cat’s environment and observe the natural behavior exhibited in the home. While the majority of our clients schedule with Mieshelle, Dr. Shultz takes clients on a case by case basis or if referred to him by Mieshelle. You can call the clinic for details on scheduling in-person consultations with Dr. Shultz in Oregon. Please feel free to call the clinic at 503-267-8888 to schedule or click “Book A Consultation” above to schedule online.